One of Alfred Hitchcock’s most revered and iconic films, ‘The Birds’ is far more than the horror film it is often remembered as, rather being an exploration of human relationships and a lesson in suspense than that of an attack of our normally feathered friends. Before angry birds were being fired out of sling shots into flimsy wooden structures they were terrorising the sleepy port town of Bodega Bay. A chance encounter for glamorous socialite Melanie Daniels (Tippi Hedren) with dashing lawyer Mitch Brenner (Rod Taylor) at a pet store in San Francisco leads to her fascination with his charm, wit and above all nerve. She travels to his bay side house, two love birds in tow, to return the surprise encounter but soon after her arrival something begins to go awry with the quaint town. Random bird attacks become increasingly common and soon the town with Melanie and Mitch at its heart is under siege from an unexplainable backlash from the skies. The film is unlikely to strike terror into too many people in this day and age due to the dated special effects, nevertheless it’s still easy to see how petrifying it would have been for audiences on its original release. The attacks may not be too impressive in terms of realism but they are unflinching in their intensity; as the dark menacing crows flood the screen it almost becomes hard to watch such is the frantic pace that the birds swam. Of course the effects aren’t the most significant part of ‘The Bird’s’ with the ‘Master of Suspense’ living up to his title. Something that often is forgotten, or overlooked, is Hitchcock’s wicked sense of humour and willing to explore the darker side of humanity that runs beneath his film’s main focuses. Mitch’s young sister wilfully questions why a man would shoot his wife as many as 6 times when surely only 2 bullets would suffice would be missed by many, though its quickly skirted over the seemingly bizarre comment is a prime take on Hitchcock’s fascination with the perverse. When the birds begin their reign of terror the townspeople take refuge in the local diner leading to a memorable collection of characters deliberating not just the attacks but also the wider picture of life, religion and sciences on the situation. These fleeting conversations are much deeper than simply time fillers; they instead offer a unique insight into the wicked genius of Hitchcock as well as where his priorities are, preoccupations that appear in much of Hitchcock’s later work. 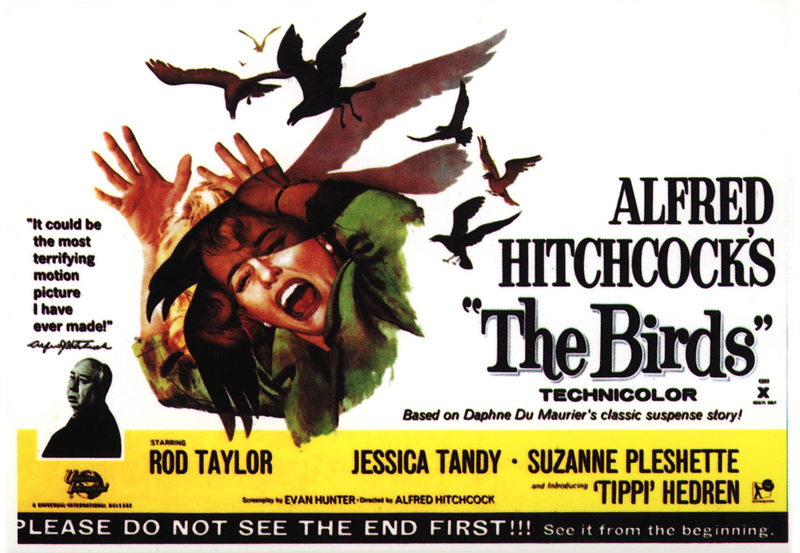 Re-watching ‘The Birds’ now it’s plain to see its influence on contemporary cinema; abnormal bird behaviour has become a hallmark of natural disaster films with recent efforts ‘Take Shelter’ and ‘Melancholia’ being prime examples. While it’s easy to spot the narrative similarities in recent films the most striking cinematic appeal is in the way Hitchcock can craft believable characters in an infamously shallow genre without compromising tension, suspense or scares. For anyone looking to see what Hitchcock was known for or what has made him probably the most important director ever ‘The Birds’ is a glowing endorsement of his legacy. Despite his techniques being forever imitated and adapted in cinema ‘The Birds’ still feels impressively unique. The dated special effects hamper how powerful it can be today but in terms of simply brilliant storytelling, character development and masterful tension its still flying high.